Sugar is a universal name for sweet, short-chain, etc. which are used for cooking food. They are basically starches, composed of carbon, oxygen and hydrogen. 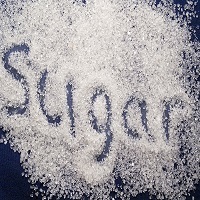 Sugars are usually found in the tissues of certain plants, but are found in adequate concentrations for effective extraction only in sugar beet and sugarcane. The most vital value feature of sugar is its purity, as it is extremely sensitive to pollution. Sugar is generally adulterated with washing soda or some insoluble substances such as chalk powder. If you want to test sugar to know whether it’s adulterated or not, then you can add a few drops of Hydrochloric acid to it and if it foams then it is clear that it is adulterated.